2 Can Age Spots Be Reversed? Recent trauma to the skin can leave behind unsightly purple scars that most people are anxious to get rid of. This type of scar can be caused by an injury, but many times it is the result of healing acne. Purple scarring is much more likely to occur in people with fair skin tones. While there is no way to immediately remove the discoloration from your skin, there are things that you can do to minimize it and speed up the healing process. Eat foods that are very high in vitamin C, such as citrus fruits, potatoes and broccoli. These foods are thought to encourage healing by producing collagen around the blood vessels, minimizing the visibility of the scar. Get plenty of zinc into your diet. Foods like sunflower seeds, lean beef and cheddar cheese contain an abundance of zinc and might speed up the healing process. Massage the area with moisturizer for three to four minutes each day. The moisturizer softens the skin while the massaging motion improves circulation and promotes even development of collagen. Apply onion extract gel to the affected area. It is believed to reduce inflammation and keep the skin from producing too much collagen, which can result in raised scarring. You will have to use the onion extract every day for several months in order to see results. Try alpha hydroxy acid, which is a natural acid derived from fruit. It removes dead skin cells and improves the overall appearance of the affected area. 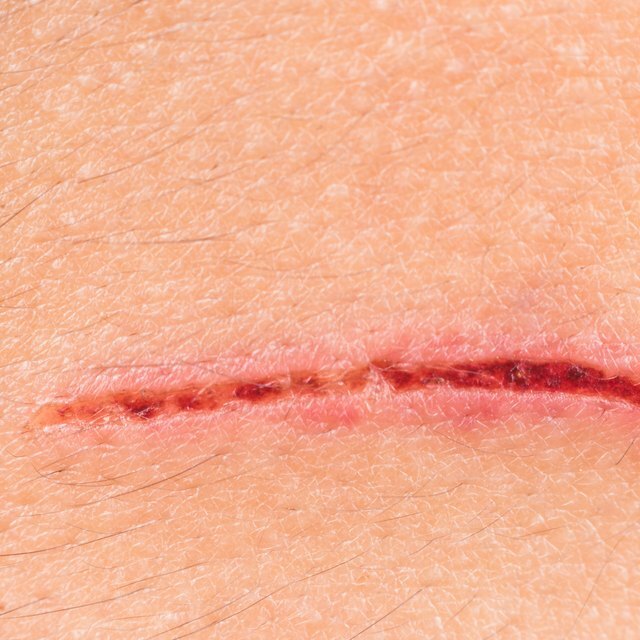 Cleaning wounds well each day will prevent or minimize scarring. Wait until the wound heals completely before applying any type of topical treatment. Columbia University's Health Q&A Service: Embarrassing Scars - How Can I Get Rid of Them? Do Carrots Give You Orange Skin?